Some weeks ago, Microsoft Research announced NLP toolkit called MSR SPLAT. It is time to play with it and take a look what it can do. SPLAT has a nice Silverlight DEMO app that lets you try all available functionality. SPLAT also has WCF and RESTful endpoints, but if you want to use them, you need to request an access key(please email to Pallavi Choudhury). For more details, please read an overview article “MSR SPLAT, a language analysis toolkit“. MSR SPLAT official project page. Silverlight DEMO app deployed to Windows Azure. I have received my GUID with example of using Json service from C# that you can find below. In following samples, I used WCF endpoint since WsdlService Type Provider can dramatically simplify access to the service. In the first call we ask the SPLAT to return list of supported languages splat.Languages() and you will see [|”en”; “bg”|] (English and Bulgarian). The mystical Bulgaria… I do not know why, but NLP guys like Bulgaria. There is something special for NLP :). The Stanford NLP Group has relocated in Bulgaria … temporarily. This is a list of full names of analyzers that are available for now. The part of the analyzer’s name that you have to pass to the service to perform corresponding analysis is highlighted in bold. To perform the analysis, you need to have an access guid and pass it as an email to splat.Analyze method. It is probably a typo, but as it is. Let’s call all analyzers on the one of our favorite sentences “All your types are belong to us” and look at the result. let text = "All your types are belong to us"
As you see, service returns result as string. All result strings are readable for human eyes and formatted according to “NLP standards”, but some of them are really hard to parse programmatically. FSharp.Data and JSON Type Provider can help with strings that contain correct Json objects. 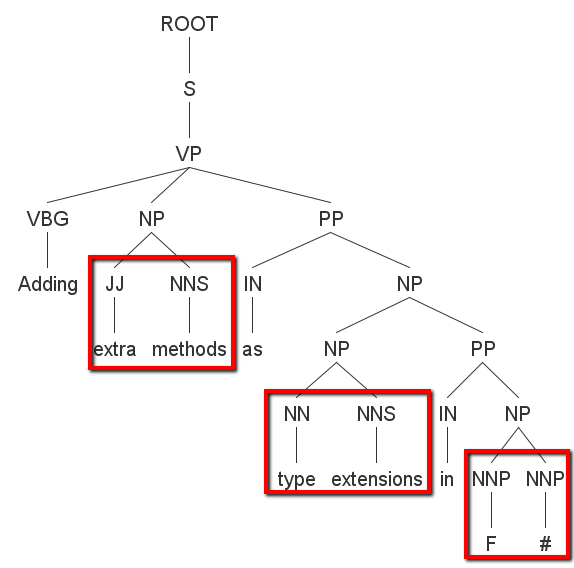 For analyzers like “Constituency_Tree-PennTreebank3-SplitMerge” you need to write custom parser that proceses bracket expression (“(TOP (S (NP (PDT All) (PRP$ your) (NNS types)) (VP (VBP are) (VP (VB belong) (PP (TO to) (NP (PRP us)))))))”) and builds a tree for you. If you are lazy to do it yourself (you should be so), you can download SilverlightSplatDemo.xap and decompile source code. All parsers are already implemented there for DEMO app. But this approach is not so easy as it should be. MSR SPLAT looks like a really powerful and promising toolkit. I hope that it continues growing. The only wish is an API improvement. I think there should be possible to use services in a strongly typed way. The easiest way is to add an ability to get all results as Json without any cnf forms and so on. Also it can be achieved by changing WCF service and exposing analysis results in a typed way instead of string. Some weeks ago, I announced FSharp.NLP.Stanford.Parser and now I want to clarify the goals of this project and show an example of usage. First of all, this is not an attempt to re-implement some functionality of Stanford Parser. It is just a tiny dust layer that aimed to simplify interaction with Java collections (especially Iterable interface) and bring the power of F# constructs (like pattern matching and discrimination unions) to the code that deals with tagging results. Let’s start with some sample NLP task: We want to show related questions before user asks a new one (as it works on StackOverflow). There are many possible solutions for this task. Let’s look at one that at the first step tries to understand key phrases that identify this question and runs the search using them. How can I build WebSharper on Mono 3.0 on Mac? How to get MonoDevelop to compile F# projects? The last one is about “MonoDevelop” and “F# projects”. We can notice that all phrases that we have selected are parts of noun phrases(NP). As a first solution we can try to analyze tags in the tree and select NP that contains word level tags like (NN,NNS,NNP,NNPS). Question : How can I build WebSharper on Mono 3.0 on Mac? Question : How to get MonoDevelop to compile F# projects? It is almost what we have expected. Results are good enough, but we can simplify the code and make it more readable using FSharp.NLP.Stanford.Parser. There are two good news for all F# NLP lovers. News #1: Using The Stanford Parser from F# is easier than it has ever been. From now, the latest version(v3.2.0.0) of The Stanford Parser is available on Nuget. If you need examples, please look at my previous post ‘NLP: Stanford Parser with F# (.NET)‘. News #2: FSharp.NLP.Stanford.Parser is first ever attempt to build strongly typed, self descriptive Penn Treebank II Tags model using power of F# Discriminated Unions and Active Patterns. All parts of speech tags and bracket labels are typed and contain informative description. All types are ready for pattern matching. Enjoy it and feel free to share your feedback. All code samples from this post are available on GitHub. 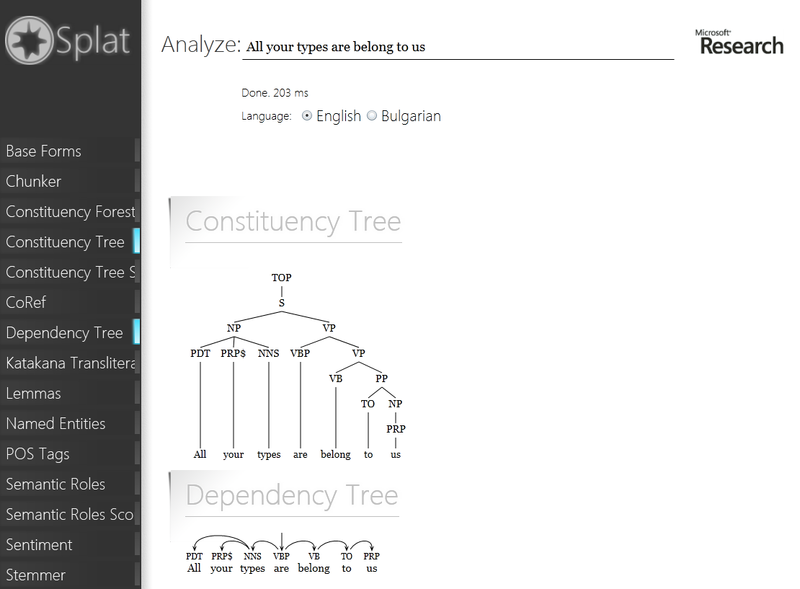 Samples for one more Stanford NLP library were ported to .NET. It is Stanford Named Entity Recognizer (NER). To compile stanford-ner.jar to .NET assembly you need to follow the steps from my post “NLP: Stanford Parser with F# (.NET)“. Also you can download already compiled version from GitHub. What is Stanford Named Entity Recognizer (NER)? Stanford NER (also known as CRFClassifier) is a Java implementation of a Named Entity Recognizer. Named Entity Recognition (NER) labels sequences of words in a text which are the names of things, such as person and company names, or gene and protein names. The software provides a general (arbitrary order) implementation of linear chain Conditional Random Field (CRF) sequence models, coupled with well-engineered feature extractors for Named Entity Recognition. (CRF models were pioneered by Lafferty, McCallum, and Pereira (2001); see Sutton and McCallum (2006) for a better introduction.) Included with the download are good 3 class (PERSON, ORGANIZATION, LOCATION) named entity recognizers for English (in versions with and without additional distributional similarity features) and another pair of models trained on the CoNLL 2003 English training data. The distributional similarity features improve performance but the models require considerably more memory. Read more about Named-entity recognition on Wikipedia. So, again, code is pretty straightforward and easy to read and understand. It looks procedural with some extra noise of type casting because of Java runtime nature. Let’s test NER on the text from Don Syme wiki page =). Don Syme is an Australian computer scientist and a Principal Researcher at Microsoft Research, Cambridge, U.K. He is the designer and architect of the F# programming language, described by a reporter as being regarded as “the most original new face in computer languages since Bjarne Stroustrup developed C++ in the early 1980s. Earlier, Syme created generics in the .NET Common Language Runtime, including the initial design of generics for the C# programming language, along with others including Andrew Kennedy and later Anders Hejlsberg. Kennedy, Syme and Yu also formalized this widely used system. He holds a Ph.D. from the University of Cambridge, and is a member of the WG2.8 working group on functional programming. He is a co-author of the book Expert F# 2.0. In the past he also worked on formal specification, interactive proof, automated verification and proof description languages.